Military strategist and philosopher Sun Tzu famously said that “every battle is won before it is ever fought.”This saying holds true in litigation, which can be won with an effective claim investigation before suit is ever filed. Each side of a legal claim comes from a different point of view. Each side has a natural aversion to see the facts from the other’s perspective, and is prone to disregard contrary information that does not fit within their own narrative and feelings. The most effective way to move the perception of each side together is the rational analysis of established facts. Rational analysis eventually occurs in a lawsuit if the attorneys on each side are acting rationally and committed to knowing the objective truth. But usually when it happens, it is too late, and defense costs act as a major drag on the overall result. Even despite the psychological impediments, reasonable settlements early in litigation are all too rare. On the one hand, if the claimant’s attorney is unwilling to cut his or her contingency fee, the claimant has no incentive to enter an early settlement. On the other hand, the lack of an effective claim investigation can also act as an impediment because it leaves no factual platform for litigants to reach rational consensus over the claim’s value early on. An effective claim investigation leaves both sides with robust and established information about the accident, and, when appropriate, experts allow each side to identify and analyze the value drivers. It will also eliminate surprises and cement information about the accident favorably to the investigating party. 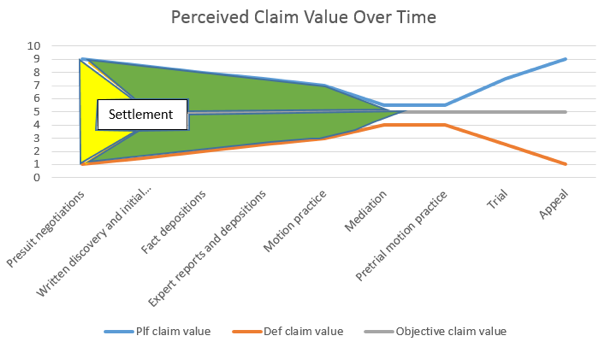 Thus, emphasizing the importance of claim investigation is a logical starting place to improve litigation results. This is a good reason for an attorney to get involved in the investigation, particularly in high exposure cases. Even if the other side is unreasonable for a time, the investigation sets the stage for a successful litigation defense. This article discusses some guidelines for an effective claim investigation, and how it can impact outcomes in litigation. After the accident, perform an internet search for news articles that may identify witnesses and responding authorities. Independent witnesses are the most credible because they lack any incentive to lie. Uncovering such a witness can result in having a claim withdrawn before suit is filed instead of a protracted and unpredictable credibility battle between the interested parties. Accordingly, leave no stone unturned. Use LexisNexis, private investigators, or SIU, and contact investigating police officers as necessary. Check Facebook and other social networking sites to preserve any relevant information related to the claimant or other witnesses and continue to monitor and preserve whatever evidence is on there. In order to obtain further access to a restricted account of the claimant in litigation, you will need to show that there is likely to be relevant information contained therein on the basis of what information is publicly available. Of course, a claimant is likely to wise up about their social networking use upon hiring counsel, so this initial monitoring period is crucial. Make a public records request to obtain the complete investigative file from any investigating authorities. Follow up with the department to specifically inquire about any video or audio recordings. Check whether a 911 tape is available as soon as possible since they are not maintained indefinitely. Determine if there is a related criminal case, and if so, obtain all the publicly available file documents. For a property loss, check records from the tax assessor’s office for relevant information, including the ownership history and tax assessed market value of the building and land. A plaintiff is only legally entitled to the lesser of the fair market value of the building (plus demolition costs) or the cost to repair. The assessor herself can be used as a de facto expert to establish the fair market value of the building in subsequent litigation. Building permits can provide a timeline of construction and identify entities that performed various work, or may disclose that someone failed to obtain a permit. Building inspection records can provide notice to an insured of a dangerous condition, suggest the allegedly dangerous condition was not glaring, or identify a potential third party who failed to identify a dangerous condition. Initial contact with the insured. The goal is to educate the insured on the claim process to alleviate anxiety and increase comfort. Smile, slow down, and be an active listener. Put yourself in the insured’s shoes and adopt a position of empathy. Repeating the insured’s statements back to them for agreement and mirroring their gestures, speech patterns, eye contact and attitude will help to establish rapport. Making the insured comfortable is critical to get an accurate and complete picture of both good and bad facts, leading to an objective evaluation of the claim’s value and confidence to resolve cases early on. Remind them not to discuss details of the claim with anyone else other than who needs to know. Remember that, regardless of your effectiveness, the insured is likely to be biased and guarded. You can expect them to keep a couple skeletons in the closet that can require follow up after analyzing what has been provided initially. Accordingly, be ready to make several rounds until you feel confident there are no skeletons left. Obtain the names of all employees or others with information related to the incident. Depending on the case, this could be everyone working before and after the time of the accident, everyone with contact with relevant actors, and all employees involved in the work process that led to the injury. In each employee interview, smile, listen carefully, and utilize the same rapport building techniques used with the insured. Always ask if each person is aware of anyone else with information, then follow up with everyone. Get information relating to the person’s experience and job responsibilities. Nail down how and when each step of the relevant work process was completed and note any inconsistencies. Learn about the equipment or product involved in the accident. While collecting the facts, evaluate the credibility of the witnesses and note any inconsistencies with what you heard from management and/or other employees. Early photographs invariably turn into centerpiece exhibits. As time goes by, photographs are likely to face an objection to being admitted into evidence. Take copious photographs to document relevant conditions, but also remember that all the photographs could be discoverable, particularly if the other side does not have an opportunity to take them. Look for all surveillance videos that could depict the scene of the incident. Footage not showing the incident itself can be just as important to establishing a timeline, to provide context, to identify other potential witnesses, and/or to disclose other pertinent facts. If management says the video is erased, consider contacting a data retrieval expert to see if it can be recovered. A recorded statement comes after a diligent initial investigation. You need to identify and to resolve inconsistencies or miscommunications before they happen in a deposition. Make particular note to identify whether any “safety rules” were broken, which is fodder for a reptile trial strategy. Also discuss choices they faced that could have increased the chances of an accident, information available when the choice was made, and what control there was over outcome. Beyond the facts, have you understood the motivations behind actions, so do not be afraid to ask “why.”Remind the insured to stay watchful for anything pertinent about the person involved or incident, and stay in touch. A recorded statement is powerful because it memorializes relevant information in a person’s own words. Courts aptly refer to statements as a “unique catalyst in the search for truth,” and are often (rightly) perceived as the most truthful version of events. The recorded statement can also be used to imbed defense themes and establish impeachment evidence. The biggest point of failure for most recorded statements is poor preparation and failing to actively listen. To prevent a preparation failure, have an outline of key points based on your investigation to make sure that an important area is not overlooked or forgotten during the statement. To prevent a listening failure, adopt a genuinely curious point of view. Can the claimant be more specific? What ambiguity is left by the statement? What potential tangents should be further explored? Is the claimant making any assumptions in making the statement? • Attack evasive answers—if the answer is “I don’t remember,” then ask did you ever know? Any documents that could refresh memory? How would you get that information? It is critical to be respectful in obtaining information. Keep in mind that the audio recording itself may be requested to be played at trial. Avoid the appearance of conflict. Those who feel mistreated at the time are most often the one’s that retain an attorney and pursue litigation. Be aware that such mistreatment could be from the insured, the insurer, or anyone they have contact with in the process. Request a site inspection and ask that all relevant evidence not be disturbed. If a cell phone may have relevant data, send a letter requesting that the information on the phone be preserved. Ask who they have put on notice, and what other potentially responsible parties exist that should be provided notice of the initial inspection. Ask for pictures of the scene prior to the inspection, and request a written protocol, if appropriate. Retain or simply contact an attorney in the relevant practice area who can recommend the appropriate experts, and then provide background information and the protocol to your attorney/expert for input. You will want to have an insured representative present only if the insured’s intimate knowledge of the scene and/or processes is likely to provide a better understanding into how the accident occurred. If they attend, keep the insured at the scene only as long as they are providing some value to you, then cut them loose. If the claimant is present and permitted to speak, gather relevant information, including whether they possess any evidence. Document all information for any involved equipment and products. Later you can obtain online product manuals. Retain all potentially relevant evidence, since it is better to have and not need it than be subject to a spoliation instruction. Do not expect the insured to retain items for months or years. Think about all aspects of the accident. Compile a list of all the possible causes, and the evidence supporting each one. Consider whether there is any party who had some responsibility to help prevent the accident, such as training or inspectors. Consider if there is anything that enhanced the damages caused by the accident. Verbally discuss pertinent aspects of this investigation with the expert but do not have them take notes of your conversations, which may be discoverable in litigation. Avoid a detailed preliminary report; rather, discuss them at the scene or over the phone. Otherwise, there is an argument that your expert had made up his mind due to bias without seeing all the relevant evidence. An advantage of having an attorney attend the inspection so the attorney can follow the expert’s thought processes in real time and provide a frank, detailed report of the expert’s preliminary opinions that is not discoverable. Another advantage of having an attorney available comes into play where there are disagreements about a proceeding with steps in the protocol that could lead to spoliation or proceeding when there are potentially responsible parties not represented. In each case, an attorney can advise if there may be an advantage to letting them proceed or whether to file a motion for a temporary restraining order. If you want peace, prepare for war. By knowing everything possible about a claim—good, bad and ugly—you have the opportunity to reach consensus and settle the battle before it is ever fought, and may avoid costly litigation. You can be confident of your analysis and will have the credibility and insight to persuade the other side in early settlement negotiations. If an early settlement is not possible, the claim will mature in litigation with an unshakable bias toward the story you want to tell, as early photographs become key exhibits, impeachment does not occur, and recorded statements become key testimony. Moreover, a lawyer forced to investigate the case on the fly during battle will not be as effective, and cases can go awry. Sun Tzu said, “If you know the enemy and you know yourself, you need not fear the result of a hundred battles.”If Sun Tzu was an insurer or lawyer, he surely would have been obsessed with effectively investigating his claims and consequently would have won many litigation battles. Jennifer Muellenbach, AIC, has spent 17 years in the insurance claims industry investigating coverages, determining liability, and resolving claims. She is currently a Claims Specialist at NSI, a division of West Bend Insurance, and can be reached at jmuellenbach@wbmi.com. Michael Aiken is a third-generation civil lawyer who uses models borrowed from strategic games and psychology to evaluate, litigate and present cases at trial. He is a partner with McCoy Leavitt Laskey LLC and handles claims related to products, fires and insurance. He can be reached at maiken@MLLlaw.com.